The statistic was divulged as part of Cook's introductory remarks, which were aired live on CNBC. Cook, who sat next to President Donald Trump at the meeting, opened the gathering with a brief synopsis of Apple's views on education. "For our company, as you know, was founded by [a] college dropout, so we never really thought that [a] college degree was the thing you had to have to do well, we always tried to expand our horizons," Cook said. "To that degree, about half of our U.S. employment last year were people that did not have a four-year degree. And we're very proud of that." The Apple chief went on to tout the company's educational initiative, saying he believes computer coding skills will be a highly desired asset for future job seekers. In particular, Apple and other tech companies will see an increasing need for talented coders in the coming years, Cook said. "So to that end, as we've looked at the mismatch between the skills that are coming out of colleges, and what the skills are that we believe we need in the future — many businesses do — we've identified coding as a very key one," he said. "We believe very strongly that it should be a requirement in the United States for every kid to have coding before the graduate K-12, and be somewhat proficient at it." 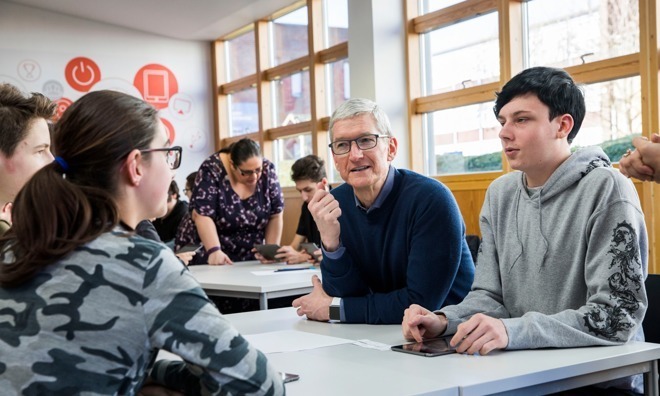 Cook detailed Apple's own coding curriculum, Everyone Can Code, which is offered to schools across the U.S. The program has been accepted by 4,000 schools and 80 community colleges, Cook said. Apple's push into the classroom leans heavily on its proprietary Swift coding language, used to develop apps and software for iOS, macOS, watchOS and tvOS. Students are offered specialized learning tools like Swift Playgrounds, as well as dedicated hardware like iPad, Apple Pencil and Apple TV. While Apple's previous educational efforts revolved around Mac, the company over the past few years has concentrated on an iPad-based curriculum, rolling out tools like class management apps Classroom, Schoolwork and the ClassKit API.